iWrite Stylus Metal Pen with Flashlight. Each stylus packaged in elegant black gift box. 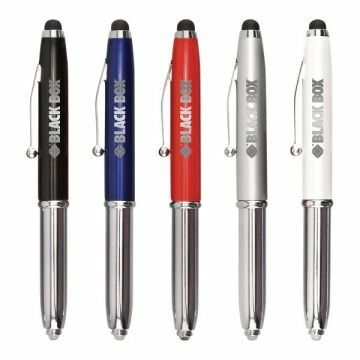 Well weighted pen with aluminum cap. Cap doubles as a smart phone or tablet stylus. Pen includes a plunger activated bright LED light. Chrome accents for a sleek professional look. the quality of the final product was great as was the service and attention from our rep, Rosa. We will be back! Very practical, helpful and reasonable. Great experience. Thank you. Precisely what I purchased. there was nothing that was unsatisfying about this product. I believe our clients will also be awed and use these often Very high perceived value and good quality.